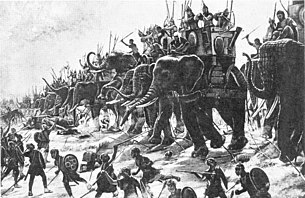 Hannibal most likely believed that the combination of the war elephants and the depth of the first two lines would weaken and disorganize the Roman advance. This would have allowed him to complete a victory with his reserves in the third line and overlap Scipio's lines. Though this formation was well-conceived, it failed to produce a Carthaginian victory. The two men are said to have met face-to-face before the battle. Hannibal offered a treaty that would give up any claims to overseas territories to ensure the sovereignty of Carthage. Scipio refused, saying that it was either unconditional surrender or battle. 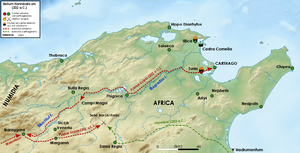 Scipio now marched with his center towards the Carthaginian center, which was under the direct command of Hannibal. 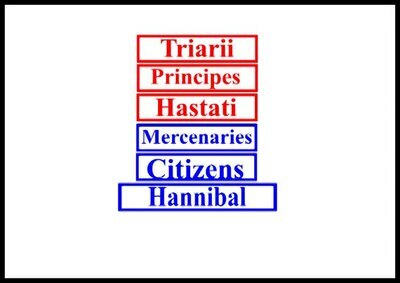 Hannibal moved forward with two lines; the third line of veterans was kept in reserve. After a close contest, his first line was pushed back by the Roman hastati. Hannibal ordered his second line not to allow the first line in their ranks. The bulk of them managed to escape and position themselves on the wings of the second line on Hannibal's instructions. Hannibal now charged with his second line. A furious struggle ensued and the Roman hastati were pushed back with heavy losses. Scipio reinforced the hastati with the second-line principes. With this reinforcement the Roman front renewed their attack and defeated Hannibal's second line. Again, it was not allowed to merge with the third line and was forced to the wings, along with the first line. Carthaginian cavalry carried out Hannibal's instructions well and there was no sign of Roman cavalry on the battlefield. Once the Carthaginian cavalry was far enough away, they turned and attacked the Roman cavalry but were eventually routed. At this point there was a pause in the battle as both sides redeployed their troops. Scipio played for time as he redeployed his forces in a single line with the hastati in the middle, the principes in the inner wings and the triarii on the outer wings. Hannibal waited for Scipio to attack. The resulting clash was fierce and bloody, with neither side achieving superiority. Scipio was able to rally his men. The battle finally turned in the Romans' favor when the Roman cavalry returned to the battlefield and attacked the Carthaginian line from behind. The Carthaginian infantry was encircled and annihilated. Thousands of Carthaginians, including Hannibal, managed to escape the slaughter. Hannibal experienced a major defeat that put an end to all resistance on the part of Carthage. In total, as many as 20,000 of Hannibal's troops were killed at Zama, while 20,000 more were taken prisoner. The Romans suffered 2,500 dead.